This joseki was a favourite of Sakata, but it has hardly been played by pros for 30 years. 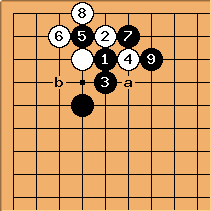 I believe the reason is that Black at a will be necessary soon, leaving Black having played two extra stones here. That is a little slow for modern tastes. Black can try to force White with b, but if White ignores that and Black plays once more to kill the corner, the local tally becomes BBBB - so White gets four plays elsewhere.